Valentine’s day is coming and you are likely searching for unique and romantic things to do in Denver, Colorado. It’s not that the Mile High City lacks ways, destination, and ideas to celebrate a romantic day with your partner. It’s more of where and how do you start? Because Denver has a lot to offer, we’re narrowing it down to the top 10 romantic things to do in Denver. Lucky that your loving prince or princess can experience a fairytale carriage ride for themselves. Book a carriage ride and ride away into your very own happily ever after. We recommend the 16th Street Pedestrian Mall and trot around Larimer Square. The gorgeous white lights will be a great backdrop for pictures to treasure. Spice up the normal traditional gifts by creating a romantic Denver wine tasting tour. Yes, you read that right, Denver has a premier wine tasting tour that can take you to the finest urban wineries in the Mile High City. Normally wine tours range from $100 to $200+ for all-inclusive packages. However, there is a self-guided wine tour option available if you’d like to impress your heartthrob. It is the Mile High Wine Pass which gives you 2 for 1 deals on wine tastings, glasses of wine and other deals! It is launching in March, Click here to check it out. Giving flowers to your loved one can be a bit boring unless you can bring the whole garden! That’s what she will experience at the Denver Botanic Gardens. You can check out their Orchid showcase running through Jan. 10 – Feb. 18, 2019, hurry up and see these beautiful exotic blooms! Love art? Then, you’ll love this next romantic destination. Standing out in the middle of Denver’s art district is the aptly named ART Hotel. Cornered by the Denver Art Museum and the Colorado History Museum, you’ll never run out of art pieces to admire. Plus, they have a fantastic restaurant and bar, Fire Restaurant. It has a cozy and high-end ambiance with it’s firepits and views to all of the downtown. Not long ago, we’ve featured Denver’s best bars. You can choose from speakeasies, cocktail bars, sports bars, posh bars that offers gourmet food and more! You’ll surely never run out of places to try, check out our best bars in the Mile Hire City in this link. Don’t forget the Mile High Wine Pass that gives you 2 for 1 deals at over 15 of Denver’s best wineries and bars! Click here to check it out. Denver also has a diverse and colorful restaurant scene. We have listed some of the best restaurants you could try with your partner here. Looking for the best dining experience in Denver to satisfy you and your partner’s palate, then you should definitely check these places out! Red Rocks Amphitheater is considered as one of the best concert venues, and for most Denver music lovers they’d agree too. You can check out the listings for upcoming concerts on their website or here. If theater, live orchestra or ballet is your passion, or just like seeing live artistic performances with your partner? Then, you should try watching a performance at the Denver Performing Arts Complex. Denver is an awesome destination for spa treatments and when you do it together with your loving partner, the experience will be taken to the next level. We recommend you check out the Ritz-Carlton’s Couple’s Spa Escape, where you’ll be treated to a side by side massage for almost an hour. Plus, there are more freebies to that, as the use of other facilities, valet parking, and more. Denver’s very own historical Brown Palace Hotel also offers one of the Mile High city’s most luxurious spas. Since we’re talking about melting the stress away, you can have the utmost merry time at the The Clocktower Cabaret. You and your partner can enjoy live variety entertainment, sumptuous eats, and luxurious decors. Laughter is the best medicine and with that phrase, this recommendation comes in handy. Hailed by USA Today as one of the Top Five Comedy Clubs in the US, Comedy Works has been Denver’s top venue for stand-up comedy since the ’80s. So, melt the blues away with your partner and have a barrel of laughs at Comedy Works. And as the season of love is here, now is as good a time as any to spice things up in your love life. 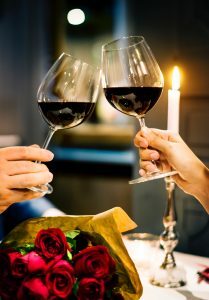 We are providing you with a head start on planning a romantic evening with that special someone. Here lies a great opportunity to get creative and choose from some great date ideas. Whether you’re going on a first date or in need of new scenery, not to worry, we’ve got you covered. Also, don’t miss out on our annual Valentine’s day dinner featured at the end of this article. The bar is one of Denver’s best wine bars. It is a great choice for wine aficionados who want to explore a collection of over 300 wines. This bar is also known for their Champagne Thursdays Social where all of their Champagnes are half off. This is definitely a place to check out in the Larimer Square area. Enjoy this comfortable, rustic and immaculately restored buildings, each Postino combines unique and approachable wines with simple, delicious and locally grown fare. Have you ever wished you could pour your own beer at a bar? Well, now you can! First Draft is a unique bar in the RINO district of Denver. They have a large variety of drinks; wine, craft beer, cider, cocktails and even coffee or Kombucha. You can pour these drinks to your liking, its like a drinks buffet! This is a must if you’re looking for awesome drinks with a unique experience! Known as Denver’s most luxurious lounge offering high-end libations served by the highest skilled bartenders. This bar is situated in Denver’s Union Station with its vibrant downtown crowd. Cooper Lounge offers an intimate and setting perfect for any date. Looking to add a bit of mystery to your date in a low-lighting setting? Then this speakeasy bar is perfect! It is known for having the best hand-crafted cocktails in the area. You won’t be able to make reservations in advance so we suggest dropping in to get your name on the list for a table. The experience of not only enjoying a great cocktail but of going through a bookshelf speakeasy style is well worth it! Ophelia’s Electric Soapbox is a fantastic Victorian style bar. It is a great place to enjoy a fun evening with a date because of their shows. Arrive early before 9pm to make sure you get a seat, enjoy some drinks and a quite setting before their normal shows begin. They have some great dishes to pair with your cocktails; the poppers and cheese curds served with blood orange marmalade goes very well with the Diamond Lil’.They typically have shows Thursday through Sunday. If you’re looking for an interacting handcrafting experience this is the place for you! Upstairs Circus specializes in providing a unique social project experience where each guest picks their own project to work and play with. There is no better way to spend a fun second or third date. Having some delicious libations while creating your own hand-crafted masterpieces is definitely a good way to enjoy each others company. Enjoy a fulfilling evening of painting, jewelry making or choose other sorts interactive projects from their project menu. You’ll enjoy creating something special to kick start your romance with any date. If you and your date are looking to have the most authentic Japanese dining experience this place if for you. Go beyond sushi and experience a genuine ambiance with the perfect authentic menu. Their dining experience has landed them as one of the top Japanese restaurants in the United States. To top it all off they have been rated the best Japanese restaurant for almost two decades in a row by the WestWord newspaper. Here you can enjoy an Italian fining dinning experience beyond the usual pasta and pizza, this restaurant offers the best in Northern Italian cuisine. It features local organic ingredients to deliver some of the most exquisite dishes paired with an award-winning wine list. The restaurant boasts an unbeatable service. This combination has awarded Panzano 4 diamonds by AAA and named one of the best restaurants in the United States. If you are looking for an upscale experience for your next date this restaurant is just right. Tip: They feature one Denver’s best happy hours from 2:30PM – 6PM. $4 draft beers, $5 wines and most dishes run from $5 to $8. Similarly to other highly rated restaurants Beast + Bottle’s food and their cocktails are natural ingredients sourced from local farms. The restaurant provides a casual dining experience that is perfect for a more relaxed date. Just like every other venue featured in this article this venue’s raving reviews speak for themselves. Beatrice & Woodsley is one of our favorite most peculiar venues in Denver. It’s high vaulted ceilings and intimate table settings create an unique experience. Nestled in an urban aspen grove, this venue offers social dinning sure to make any date a success. This restaurant offers American cuisine derived from new and old world flavors. This restaurant offers one of the most unique dining experiences in Colorado. This modern steak house offers a classy dining experience sure to impress any date. This fantastic restaurant was chosen as 2015’s Best Steakhouse in Denver. Hop on over for its great happy hour served on weekdays from 3 to 6pm. This is the perfect venue to get fancy and dress up for a night out with your sweetheart. Arrange a quaint evening with you honey at one of Denver’s best kept secrets. The menu is made up of locally sourced desserts and flavorful bites that compliment their cocktail list. The live jazz piano and acoustic guitar played regularly at the]is hotspot is sure to have your honey swooning. They say it’s the perfect stop before or after the theater, a concert, or comedy performance. This restaurant appeases to the artisan style date where you can have the space to vibe and be creative with your date. The menu is made up of small and delicious eats meant for sharing. This place is definitely for a date with someone you can let your hair down with and inspire. Pick a corner to share dialogue with other painters, poets, and artisans; or enjoy one of their shows that you can catch on various days of the week. Thursday through Saturday the Opera house has their big productions: 3 to 4 local indie bills – from burlesque to folk, opera to dance parties and rock ‘n roll. Every night they host different entertainment: Tuesdays are for the Songwriter’s Open Mic and Wednesdays are for their Comedy Open Mic, where working Denver comics get to work-out their new material.